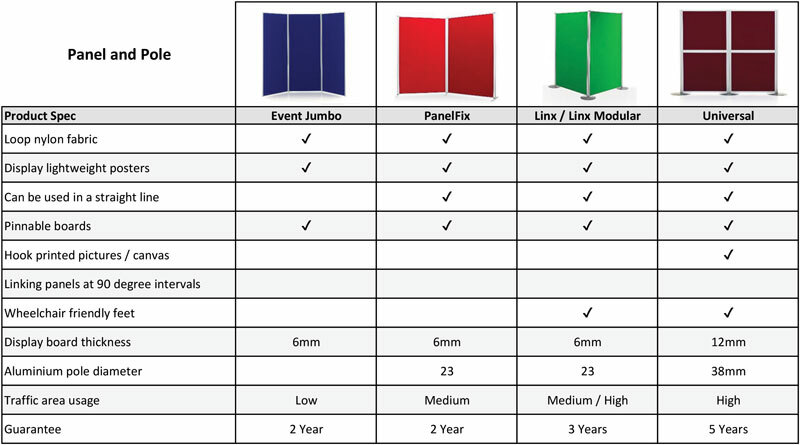 Jumbo display boards offer a comprehensive solution for exhibiting large amounts of content. The lightweight yet strong design ensures the display boards are easy to transport while still being sturdy once set up. All the large display boards feature a loop nylon fabric, which allows content to be easily applied using only hook dots or hook tape. This has the added bonus of protecting both your content as well as the panel from permanent damage often caused by pins. 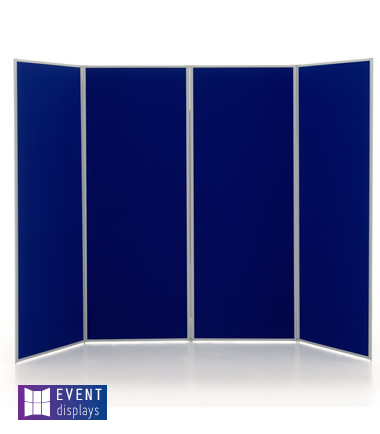 We have a variety of different jumbo display stands available, from folding display boards, room dividers as well as panel and pole display boards. Each has unique properties which allow your content to have an effective impression in its environment. The sturdiness of the panel combined with the aluminium metal work guarantees the stability of the jumbo display boards at exhibitions, trade shows and other locations where there is a moderate amount of footfall. At Rap Industries, we make each product to order, which allows them to be customised and modified to suit the needs of the client. This means the number of panels, fabric colour, framework colour and much more can be modified to add more of a personal touch. With each order that we process, there is a stringent checks process to ensure that all the large display boards produced meet the standards we expect. Manufacturing of the jumbo display boards begins with an intuitive lightweight core which is then compressed to create a sturdy panel. These are then covered with the loop nylon fabric which can be customised in a range of different colours. Finally, the aluminium framework is added to include the final finishing touches. With all of the large display boards that we produce, there is a manufacturer's guarantee included. To ensure your content makes the best impression possible, we create each display stand to order, which allows them to be customised. This hands control over to you and allows the number of panels, fabric colour, framework colour and much more to be personalised. We even provide a selection of accessories which offer the perfect way to enhance your display and make it more eye-catching. Despite the size of the jumbo display boards, we design them specifically so they are still easy to transport. This is achieved by using the lightweight panels combined with the aluminium framework to create a nimble display system. If you would like any more information on the display boards or whether they would be suitable for your content, then you can get in touch with our team of advisors by calling 01733 394941 or by sending an e-mail to [email protected].